We provide chauffeur services across a broad range of areas, including: V.I.P. and Executive Services, Corporate Events and Dining Appointments, Conference Transport, Airport Transfers, Irish Tours and Vacation Travel, Sports Event Transport, Golf Holiday Travel, Horse Racing, Sailing and Fishing Vacations, Weddings, Debutants and Social Outings for small or large parties. JDF Chauffeur Drive Services provides expert guidance on all aspects of V.I.P. transportation. 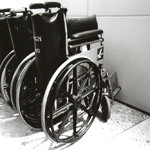 Issues such as V.I.P. 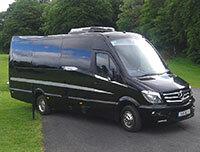 Airport Transfers, Security, Accommodation, Social Engagements and Touring can all be handled by or co-ordinated with us. 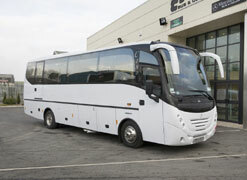 Our vehicles are all top quality and maintained in pristine condition. They are all fully air-conditioned and range from Mercedes and Lexus vehicles to luxury mini-coaches and up to 52-Seater luxury coaches. Helicopter transport can also be provided. 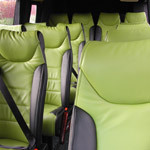 Esker Cimo - The Cimo (above) has established an excellent reputation with operators, drivers and passengers alike thanks to its superior build quality, excellent handling and the utmost in passenger comfort. Let JDF Chauffeur Drive Services take care of the planning and co-ordination of your Corporate transport needs in through-out Ireland.